In 2014, 94% of boys in Grade 6 and 97% of girls reported that they had never drank alcohol in the last 30 days. The proportion of boys and girls who did not drink declined as the grades advanced. 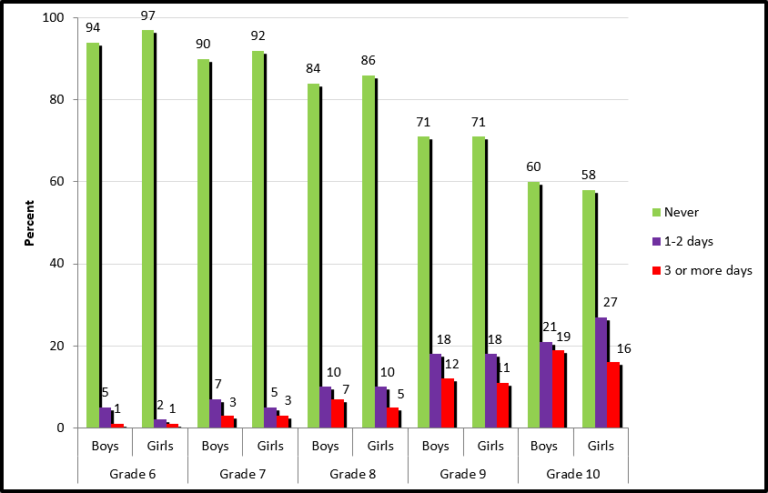 By Grade 10, only 60% of boys and 58% of girls had not consumed any alcohol in the last 30 days. The frequency of drinking also increased with advancing age. 16% of girls and 19% of boys in Grade 10 drank 3 or more days in the last month, compared with 1% of both girls and boys in Grade 6.